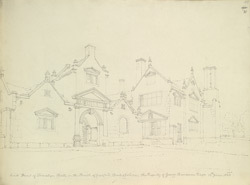 This drawing shows the impressive east front of Trevalyn Hall in the parish of Gresford, Denbighshire. John Trevor built the house in 1576 and it is one of the largest Elizabethan houses in the area. Gresford is situated on the rivers Allyn and Paterson and was granted village status in the 1820s. At the time that Buckler drew this picture in the summer of 1823, the house was occupied by William Boydell who modernised and renovated the hall. He also built the pretty parish church of St Mary nearby.